Whether or not you’ve touched a tutu or performed a plié, you’ve surely heard of Marius Petipa’s (pronounced PET-ee-pahs) ballets. Does Swan Lake ring any bells? What about Sleeping Beauty? And that holiday classic, The Nutcracker! But here’s the oddest thing: Petipa—born in France—is considered the “Father of Russian Ballet.” How’d that happen? When Petipa arrived in St. Petersburg, Russia in 1847, he was considered just an “okay” dancer. Decades later, however, he had successfully danced his way up the ladder at the Russian Imperial Theatre. To celebrate this famous choreographer, the Mariinsky Ballet performs Le Corsaire (COUR-sair, The Pirate). Set on an island in Greece, this ballet is filled with exotic characters, a shipwreck, treachery, romance, betrayal, and a boatload of pirates! The story of Le Corsaire was loosely adapted from Lord Byron’s poem of the same name. The first production was choreographed by Joseph Mazilier in 1856, but Mariinsky’s version is a reconstruction of Marius Petipa’s choreographic revival about 10 years later. Now here’s the interesting part: Petipa didn’t just choreograph one production of Le Corsaire. He actually revived it four times—each time adding more pas (pronounced pah, incidental dance variations that don’t necessarily forward the plotline or character development). This shouldn’t come as a big surprise since Petipa was famous for developing the form of the grand ballet—a multi-act production with a fully-developed plot, pantomime acting, and lavish sets and costumes. And you’ll soon see that Le Corsaire absolutely fits that definition. Three corsairs (“pirates” in French) struggle to save their boat during a storm. Their efforts fail and the boat sinks. Shipwrecked on a Greek island, the corsairs named Conrad, Ali, and Birbanto are saved by a group of young women. If found by the Turkish patrols, the men will be in immediate danger. The women decide to hide them as one of the women, Medora, falls in love with Conrad. Meanwhile, Lankedem, an evil slave trader, is pillaging the Greek coast in search of women to seize and sell. The women successfully hide the corsairs but are captured by Lankedem’s men. Caption: Mariinsky dancers are renowned for their impeccable technique and their focus on storytelling. From his powerful throne in the marketplace, the sultan Seid Pasha is eager to add young women to his harem. Lankedem is equally enthusiastic to fill the sultan’s wish and sells Medora’s friend Gulnara to him. Then, just as Medora is brought in, another bidder enters the market area—the pirate Conrad in disguise. When Seid Pasha confronts Conrad, the other corsairs throw off their cloaks, seize the evil Lankedem, and rescue the women. The Seid Pasha is furious at the useless Turkish patrol. Caption: Pas (incidental dance variations) are common in Petipa ballets. While these dance variations might not move the plot forward, they still help the audience better understand the characters. The corsairs cheer the rescued women as well as the money they stole from the sultan. In celebration, Medora dances with Conrad and his friend Ali. The other women, however, express to Medora their desire to return home to their villages. Birbanto wants the women to stay, but Conrad is convinced by Medora to take the women home. Lankedem watches this conflict grow between Conrad and Birbanto. In exchange for his freedom, he offers Birbanto a sleeping potion. The plan is for Birbanto to pour the potion on a bouquet of flowers and give it to Medora. Medora passes the flowers to Conrad to thank him for his chivalry. Conrad falls asleep as Lankedem abducts Medora and he escapes the cave. Caption: Medora is considered the most beautiful woman on the island; her movements are graceful and virtuosic. Lankedem brings Medora to Seid Pasha’s harem, where he eagerly buys her from the slave trader and celebrates his new prize in his “garden of beauties.” Suddenly, mysterious pilgrims enter the palace and are invited to join the evening prayer. But Medora recognizes the visitors to be the corsairs, once again in disguise. The pirates surprise attack Lankedem’s patrol and Conrad saves Medora once and for all. Medora, Conrad, and their friends sail toward their next adventure. Everything about this production is grand—from the spectacular sets and ornate costumes to the challenging choreography and large cast of dancers. The intricate plot calls for such grandeur, but it is also a famous quality of the Mariinsky company itself. Let’s take a closer look at what makes this production so impressive. The sets in Le Corsaire feature spectacular backdrops, curtains, and panels that set the scene without taking up the dancers’ real estate on the stage. There are a couple of scenes (including the slave auction) where there is a small platform on stage. But for the most part, the stage is wide open. This allows for a large number of dancers to be on stage and for them to perform dynamic, traveling choreography. This is particularly noticeable in the opening of Act II where the corsairs and women are celebrating. Caption: A scene inside the elaborate cave setting. The costume design in Le Corsaire fuses Eastern-inspired apparel like harem pants and intricately wrapped stomach baring tops, with more traditional ballet apparel and accessories, including grand tutus and leotards and tights. Both the men and the women are dressed from head to toe. Headpieces and hats, facial hair and wigs, jewelry, and specially crafted shoes all reinforce characterization in Le Corsaire. Caption: The costumes in Le Corsaire are extremely detailed and ornate—from the dancer’s headpiece and hairstyle to the pattern on her shoes. Caption: The costume design fuses traditional ballet tutus and pointe shoes with more Eastern inspired apparel. 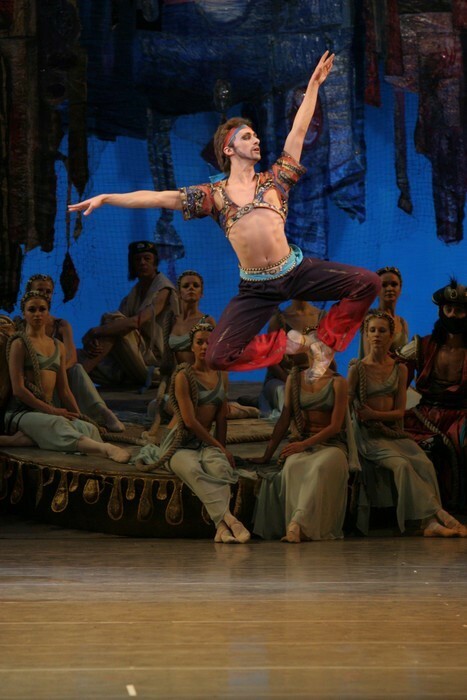 Le Corsaire features both virtuosic choreography as well as elaborate pantomime. In fact, the character of Conrad initially didn’t dance at all—he only acted through pantomime. Pay attention to the height of their jétes (zhuh-TAYS, jumps), intricate pirouettes (peer-WET, whirls or spins sequences), and effortless athleticism. Additionally, the corps de ballet (core duh bah-LAY, dancers in a company that perform as a group) demonstrates its unity of style. Caption: Years of training allows this dancer to travel through the air with amazing flexibility and height, making this difficult jump look effortless. Additionally, Mariinsky dancers have distinguished themselves for their beautiful port de bras (pawr duh BRAH, technique of moving arms gracefully) and epaulement (ay-pohl-MAHN, placing of the shoulders and head). This meticulous attention to expression, fluidity, and detail gives a sense of aristocratic elegance. Caption: The corps de ballet often works as a backdrop to the principal dancers. The female dancers don’t always wear pointe shoes. They perform the more folkloric choreography in character shoes with a short heel. Pantomime is a major element of Le Corsaire. It often helps to set the scene but is also incorporated into much of ballet choreography. For example, watch how Seid Pasha’s movements and gestures tell much about his intentions. Another dramatic moment of pantomime is when Conrad smells the bouquet of poisoned flowers at the end of Act II. The score for Le Corsaire is a hodgepodge of tunes from many ballet composers, the result of scenes added over many years by Petipa. The “legend” is that ballerinas would often demand “a special solo” be added whenever they entered a production. Over time, each favorite solo became part of the standard version. In fact, ballets like Corsaire, (which didn’t start with a strong central score like Swan Lake and The Sleeping Beauty), were often subject to these kinds of musical additions. Listen closely. Some music seems more Eastern Greek-inspired with accents from tambourines and flutes while other compositions sound like they may have come from another ballet like Swan Lake or The Sleeping Beauty. Le Corsaire has been performed internationally for over 250 years. Why do you think it remains so popular? How is Le Corsaire similar to ballets you might have seen in the past? Can you make a list of qualities common among Petipa’s ballets or other classical ballets? “Seeing a ballet” means more than simply watching dancers dance. A ballet is a total theatrical production with all parts working together, from the sets and costumes to the music and choreography. Think about how seeing Le Corsaire has changed your perception of ballet. In Le Corsaire, the ballerinas perform in both pointe shoes and heeled shoes. For some background info, here’s a bit of history behind the evolution of the ballet shoe. Ballet and pointe shoes might seem inseparable today, but the art of ballet actually came about 200 years before ballerinas began dancing on their tiptoes. The Royal Academy of Dance was founded in France by King Louis XIV in the mid-seventeenth century. While ballet was practiced all throughout Europe, this Academy helped codify the language of the art form (which is why ballet terminology is in French). As ballet grew out of the social court dances, both male and female dancers wore heeled shoes (as you’ll see many dancers wear in the start of Act II). As you can imagine, heels inhibited a lot of movement. The heel was “dropped” in the early eighteenth century; the more formal shoe allowed for greater articulation of the foot (think of demi-pointe/soft ballet slippers that we have today). By the late eighteenth century, choreographers began experimenting with wires and harnesses to elevate dancers from “mortal to ethereal.” Dancers also began stuffing their shoes with padding to get higher and higher on relevé (reh-luh-VAY, a raised body). Soon after, alterations were made to the shoes themselves to make this toe work more possible. The pointed-tip shoes were swapped with a sturdy front platform, or a layered fabric “box” to encase the toes, and a stiffer (but silent) sole. What we consider “modern day” pointe shoes are even stronger and sturdier than those early versions. Surprisingly, the pointe shoe has remained relatively unchanged over the past 200 years despite the increasing demands of modern ballet dancing. A professional ballerina can wear up to 120 pairs of pointe shoes in a year and will often “alter” her shoes depending on a particular role (breaking them in more or stiffening them to last longer). Dance shoe companies provide the pointe shoes—the tools for the art—but it is often the dancer’s responsibility to mold and shape the shoes to fit her needs (and to care for her feet with tape, toe pads, etc.). Learn more about the pointe shoe with this ARTSEDGE resource. Classical ballets were generally based off well-known fairy tales, fables, and folklore. Some examples are The Sleeping Beauty, Romeo and Juliet, and Swan Lake. Le Corsaire follows this model in the story elements of a shipwreck, a sleeping potion, and a happily-ever-after ending. Think of a well-known story you especially enjoy—anything from the Three Little Pigs to Spider-Man. Either by yourself or with a group of classmates or friends, tell your story through movement using choreography and/or pantomime. Like a game of charades, communicate your tale without speaking. If you choose to present your work to your class or family, see if they can guess the story you’ve chosen to tell. The Mariinsky Theatre can trace its history as far back as 1783. The building has survived both physical and political challenges, and the roster of artists who have called Mariinsky home includes many famous performers, composers, and choreographers. To learn more about the Mariinsky Theatre’s rich history, check out the venue’s official website. 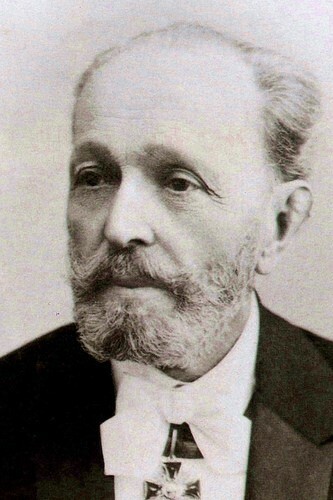 Marius Petipa, often called the “Father of Classical Ballet” created many well-known ballets including Swan Lake, The Nutcracker, and The Sleeping Beauty. Petipa made a name for himself at the Mariinsky, known back then as the Imperial Theatre. During his tenure at the theatre, Petipa choreographed more than 60 full-evening ballets, including Le Corsaire. You’re ready for Le Corsaire.